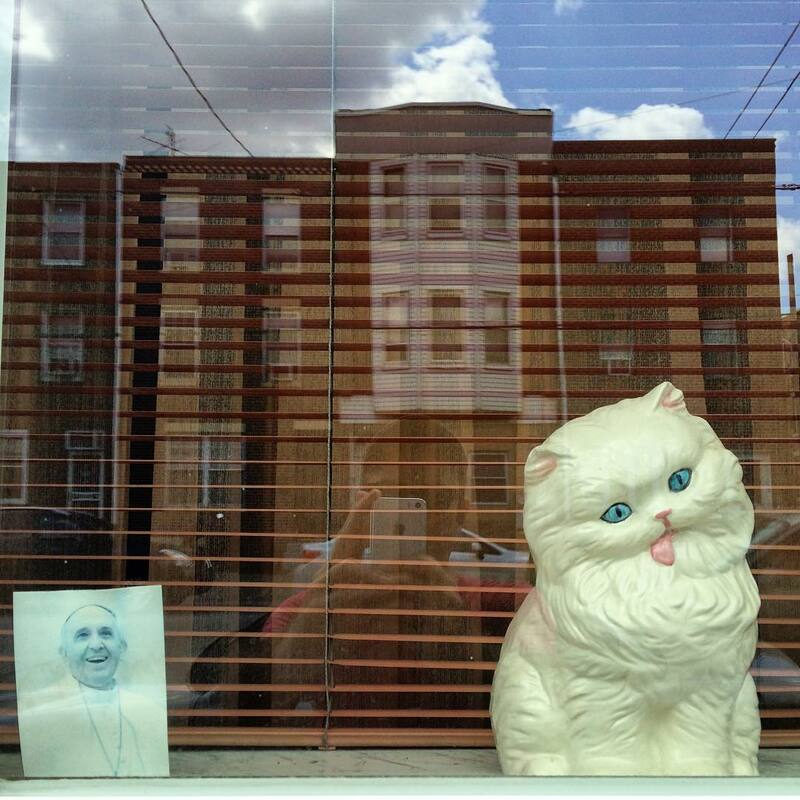 We all know the typical arrangement of Philadelphia row house window displays. 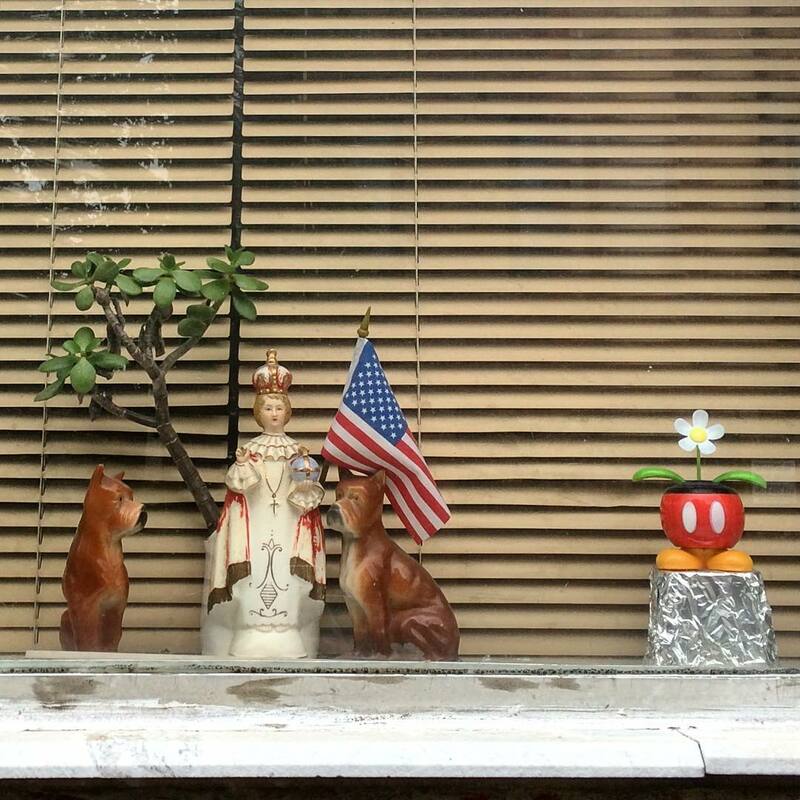 Silk flowers and ceramic figurines are common staples seen peeking out onto the street from the façade above. They’re mostly neutral in meaning, and they don’t need to be changed with the seasons. 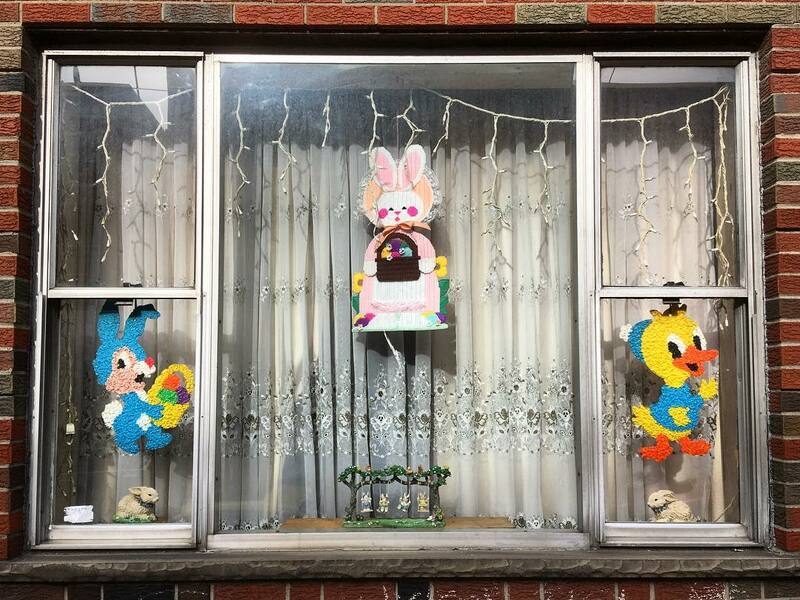 A Nativity scene, the Easter Bunny, and a Star of David accompanied by a menorah, on the other hand, must be rotated throughout the year to reflect their given holiday. Decorations are stored in the basement to be arranged and rearranged each season. 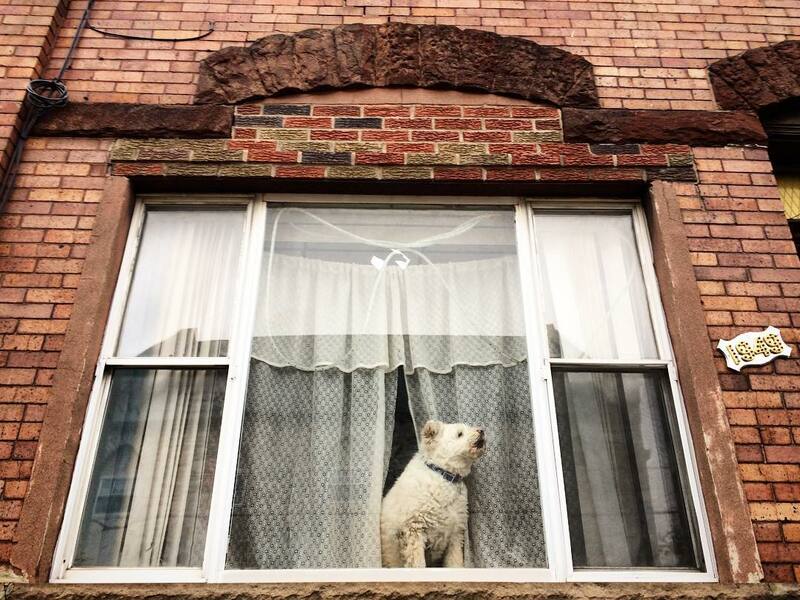 Plants, cats, and sometimes dogs bask in the sunshine or bark at passersby, moving themselves when the light fails or everyone has finally come home. Fandom rises and falls with the fortunes and failures of our sports teams from year to year and season to season. On the one hand, these political signs are completely unremarkable. Campaign posters have been in use for hundreds, if not thousands, of years. As far back as 79 AD, there were political notices on the sides of houses in Pompeii. In 1824, John Quincy Adams was among the first American presidential candidates to use posters widely, and others quickly followed even more aggressively. American political posters as we know them emerged in the 19th century cities where density and scale made mass communication possible. They were posted in taverns and other public spaces used as centers for democratic political discussion. These graphic forms were then reshaped by the middle of the 20th century by the suburban lawn and the highway median which were sites that private citizens could express their views to their neighbors. Like the earlier urban forms of political communication, this mode of expression was also called for by a changing connection to space. In the suburbs, our relationship to the people next door was suddenly transformed by the new social arrangement of a hedge, a fence, or a yard. 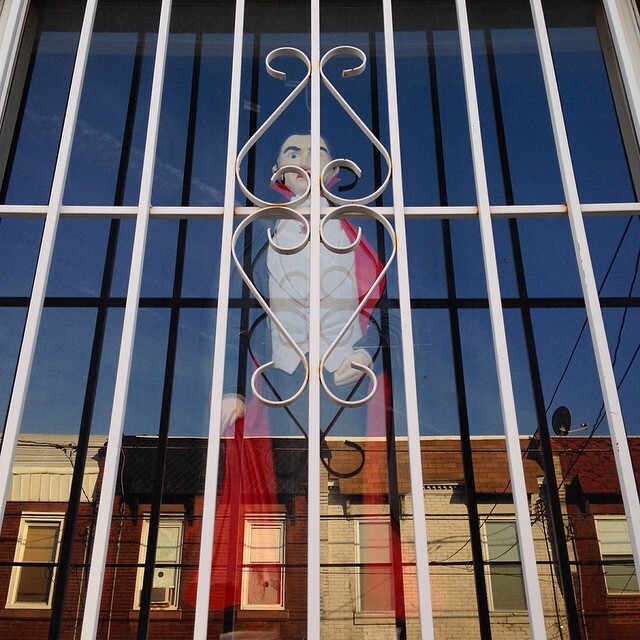 What we see today in places like South Philly is a combination of the original tradition of political communication as an urban phenomenon and a domesticated version of campaigning from the post-war era. 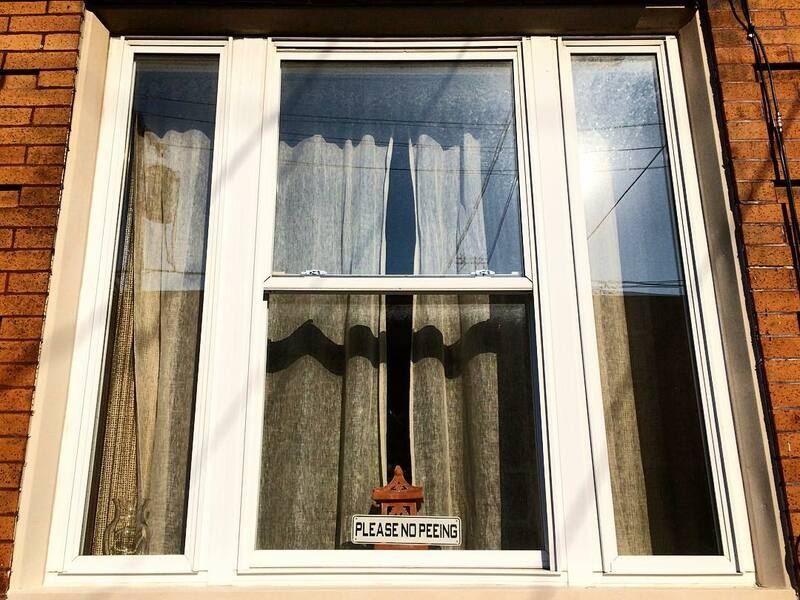 Just as the suburbs rely on lawn signs and bumper stickers, posters in windows in Philly are dependent on architecture and the evolving social space of the city. Philadelphia’s housing stock is 70% row homes. The row houses here emerged primarily in the late 19th and early 20th century because they were cheap to make (essentially brick boxes with shared walls), because they fit neatly into William Penn’s grid as it extended farther and farther out, and because you could fit a lot of them into a small space. Row houses could accommodate and assimilatie masses of new immigrants and other working class people into the ideology of the nuclear family and private property. As tightly packed as these houses clearly are with their party walls that minimize the possibility of side window installation, the “Workingman’s House” were designed with front windows to let light and air in and to look out onto the street. However, they would have likely had shutters to keep a home cool in the summer and insulated in the winter. 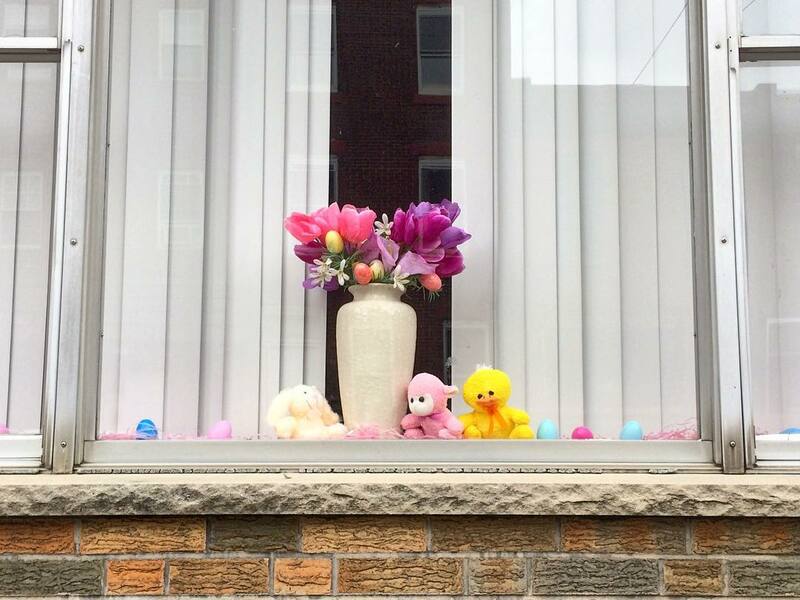 Thus in the late 19th and early 20th century, the row home was built to make window displays possible, but the demands of hot summers and cold winters meant that the threshold between the home and the city was closed as much as it was open. 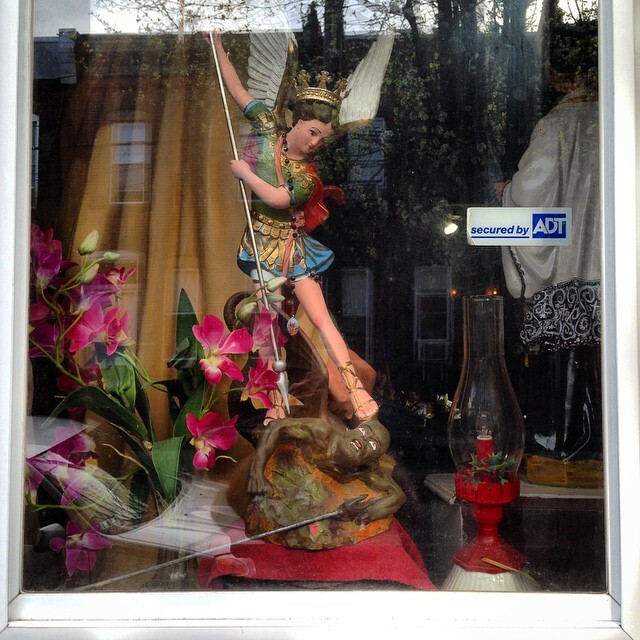 The wild, wonderful world of South Philly window displays. 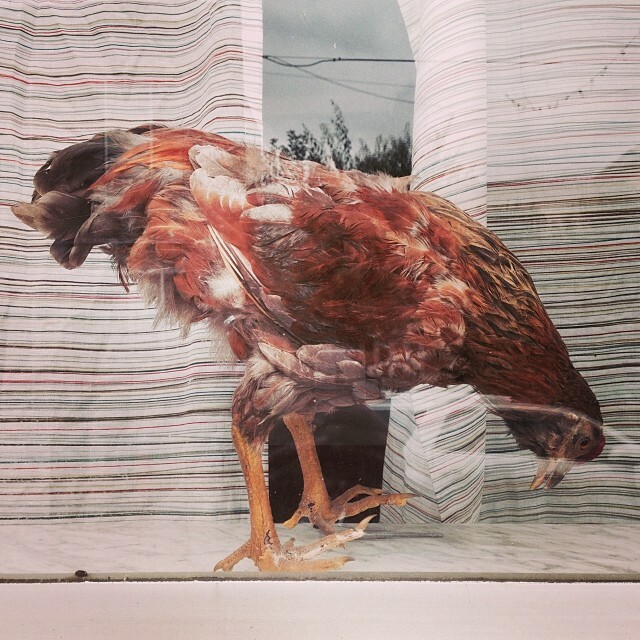 Photos by Michael Bixler. Yet, the function of the window is not just a matter of temperature and humidity. The relationship to the public space of the street and to one’s neighbors is a relationship that is transformed by the single-family row house, which is created by and for the urban environment. On the one hand, we are in such close proximity to our neighbors that we can’t help but know them and interact with them in the spaces outside of our homes. When the weather is nice, we all spill out onto our stoops and our sidewalks and our streets where we say hello to each other and catch up on the gossip we missed over the winter. On the other hand, there are so many of us that an anonymity is possible that isn’t in small towns. We look out on the street and we live in the street, but we can also live a life of relative anonymity. Urbanization can force us together, but it also creates crowds and, in Philadelphia, houses that set us apart. However, it is our windows that bridge these gaps. 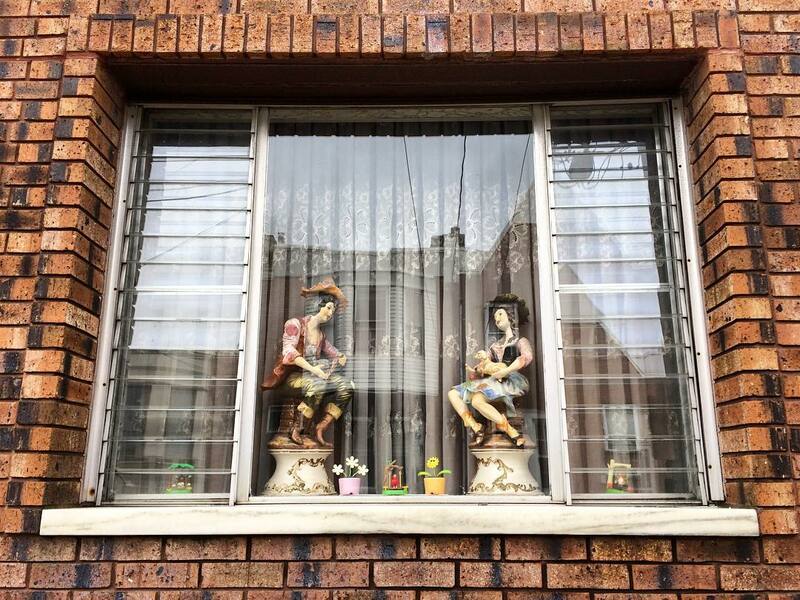 Our windows are the dividing line between our homes and our streets, between our private spaces and our public spaces, between something personal and something collective. Yet they are not border walls. They are transparent. They are permeable. When we make them sites of display, they become a way of sharing something of ourselves with our neighbors, of bringing the street into the home and the home into the street. 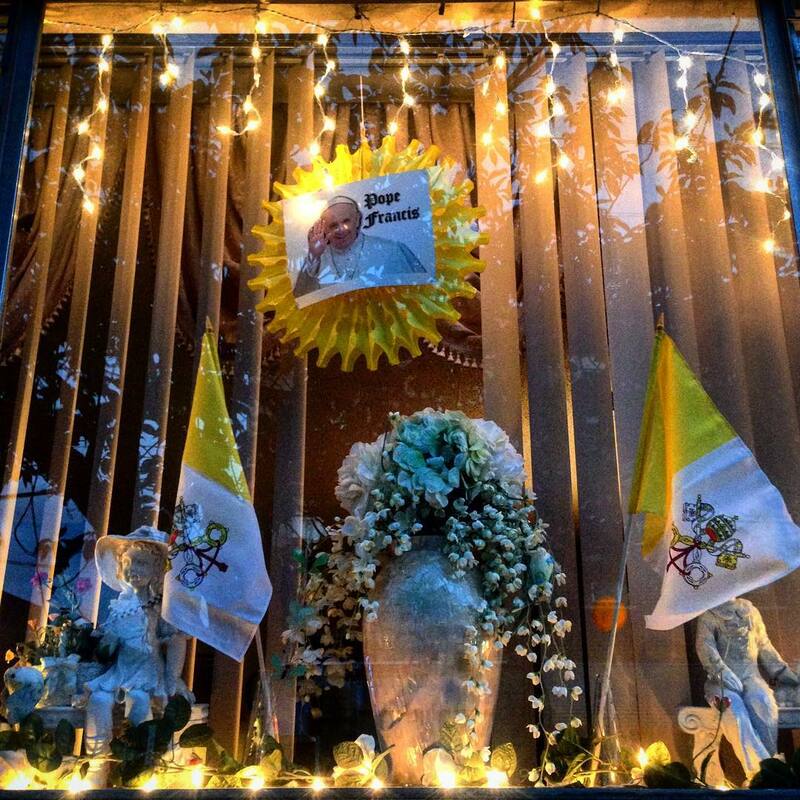 Now with Easter over, Independence Day not yet upon us, and an election looming, in South Philly we see the usual silk flowers and plants in the window from those that prefer not to get involved, but we also see a lot of Elizabeth, Tom, and Jonathan. The standard signs distributed by the campaigns are easy to throw up in our windows alongside signs declaring “Hate Has No Home Here” or “Philly Says No to Hate.” Campaign signs legitimately tie us to the rights and obligations of citizenship and to democratic participation, but they are still an easy form of political expression that can be handed to us by graphic designers and canvassers. Other displays take a different tactic. They are homemade and they are personalized, to begin with. They don’t necessarily ask us to vote the way campaign signs do, but they do ask us to engage with and respond to the worlds around us. Kate lives on S. 12th Street between Reed and Dickinson with her husband and two sons. She has lived in Philadelphia since 1992 and in her current home since 2000. 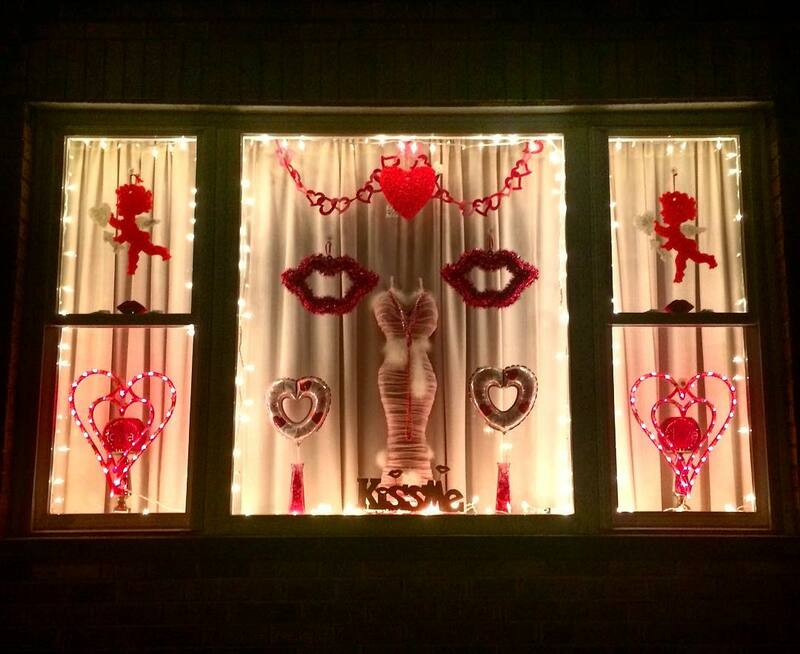 While Kate has put up her husband’s kitschy Christmas decorations and her children’s Valentine’s Day artwork in the past, she has never committed to any more of a window display until January 2017. After Donald Trump won the presidency, Kate feared that our rights could immediately be taken away, taken away from women, from Muslims, from immigrants, from anyone. Saying something about this fear suddenly seemed urgent. 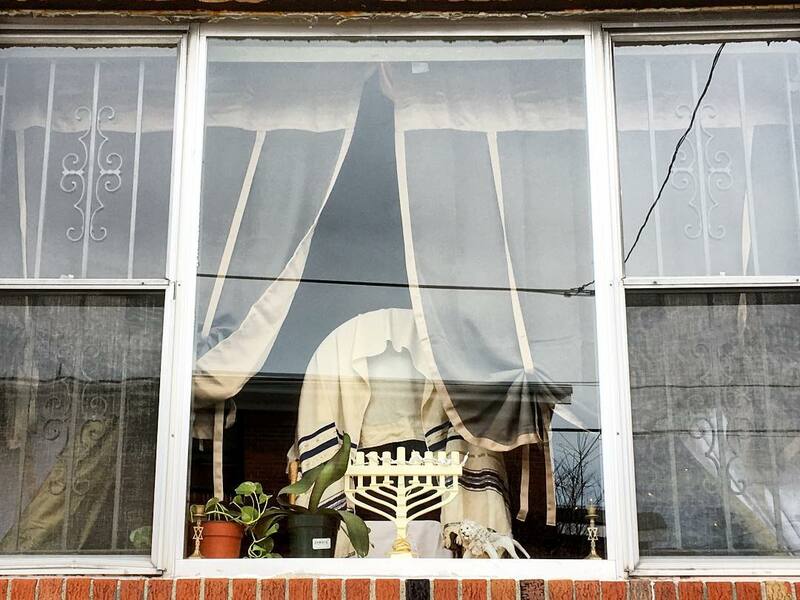 When she put them up, she wanted her windows to remind people that they had freedom of speech and religion, and of course she wanted to express her own. She also wanted people to know their rights, to be reminded that they have rights. When we’re afraid something is going to be taken away, it can be hard to remember that right now we have to use it. She had the text printed up on a large printer at work, and she put the signs up on Inauguration Day. She is committed to keeping them up until Trump is out of office, one way or another. Zoe and Lynn on Dickinson between 13th and Broad Streets have pretty much the same idea. In all caps on individual sheets of printer paper their window spells out the words “IMPEACH TRUMP NOW.” Unlike Kate, they don’t remember when they put up the letters. There wasn’t an identifiable moment when they looked up and thought they needed to say something and our window is the place to do it. It just seemed obvious to them. While it was the current political moment that spurred Kate to display, Lynn and Zoe have long been dedicated to arranging their window. 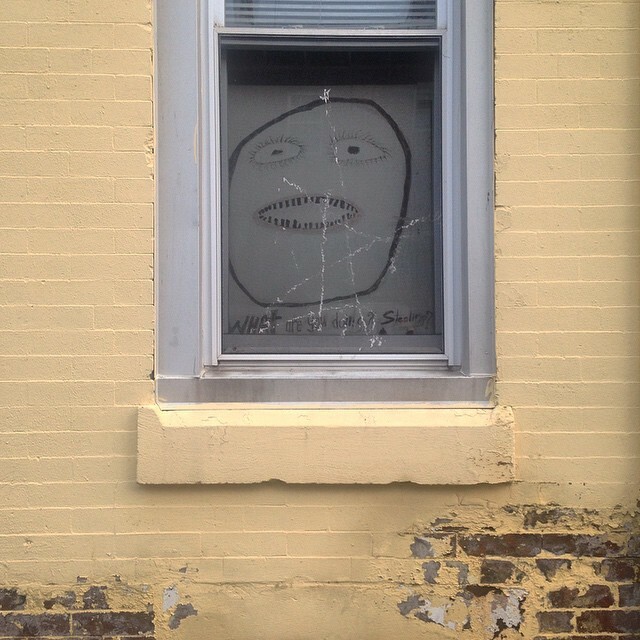 They moved to South Philly in the 1990s and moved into this house on Dickinson Street in 2002. 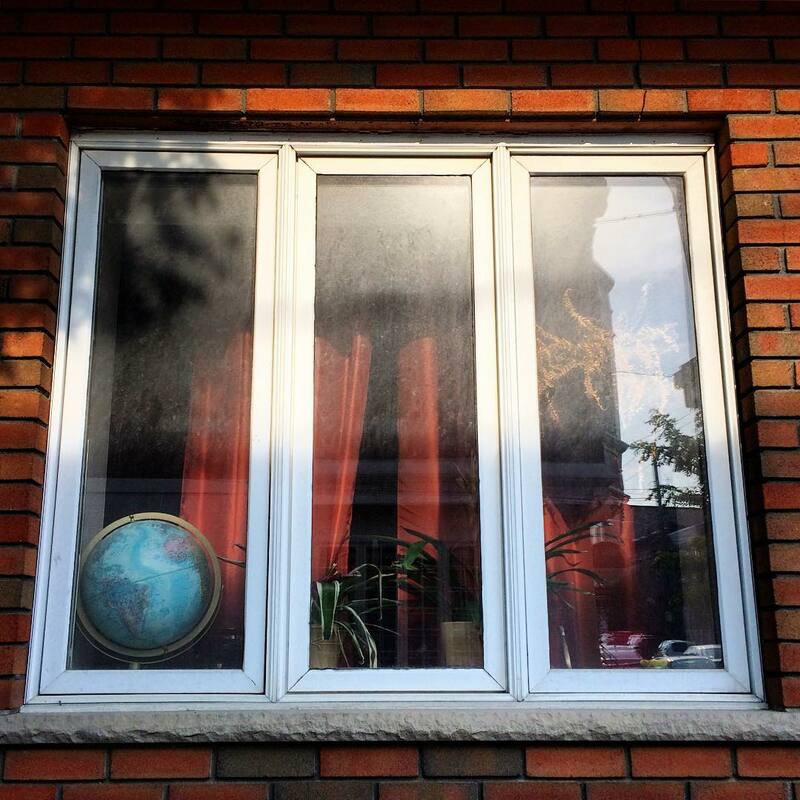 When they looked, they looked specifically for a house that had a good window. Among their first displays were Halloween displays, but a benchmark for them was something they put up in September 2003 when country singer Johnny Cash died. They change their displays regularly, but not on any schedule. They change when it seems like it’s time. IMPEACH TRUMP remains, but on the platform built on top of the ledge, winter holidays were replaced by the Eagles, and in the last few weeks, the Eagles have been succeeded by the Sixers. Their kitschy, thrift store artifacts–Iverson bobbleheads, foam fingers from NBC Sports, curtains printed with NFL logos, a leftover box of matzoh–feel somehow at home underneath printer paper and block letters. This is not a staged window that imitates Macy’s or is in any way interested in conventional good taste. It is a collection and a collage. It is a scrapbook. On the one hand the two parts of the display seem unrelated, but ultimately they create a striking dynamic. In this window, it is the national versus the local. It is our federal government versus civic pride. It is America versus Philadelphia. It is also, as Zoe herself sees it, hate versus joy. When the Eagles won who wasn’t swept up, who didn’t smile, who didn’t rush to Broad Street to celebrate? Even those of us who don’t care much about football felt proud to be here in Philly, where people still ask, “So, what brought you here?” as if there needs to be a reason. And not unlike the Sixers’ new playoff logo, or their use of the calligraphy script, or their 1776-themed hype videos, the collections that Zoe and Lynn bring out trace our history, albeit a microhistory of commercial merchandising as much as of revolution. They display the things that most people throw out, and those things become a connection to our childhoods. Remember when you had those curtains in your bedroom? Remember drinking soda out of that plastic cup so you wouldn’t break a glass one? These are mementoes that have lost their momentousness, only to gain it back again in a window celebration for a championship we’ve been waiting for for an awfully long time. These artifacts remind us of heartbreak sometimes, but also of pure joy. Most people love Zoe and Lynn’s displays. They get notes slipped through their mail slot. They get comments when they leave their front door open in nice weather. People are relieved to hear their private thoughts spoken out loud and put on public display. Not everyone, but most. 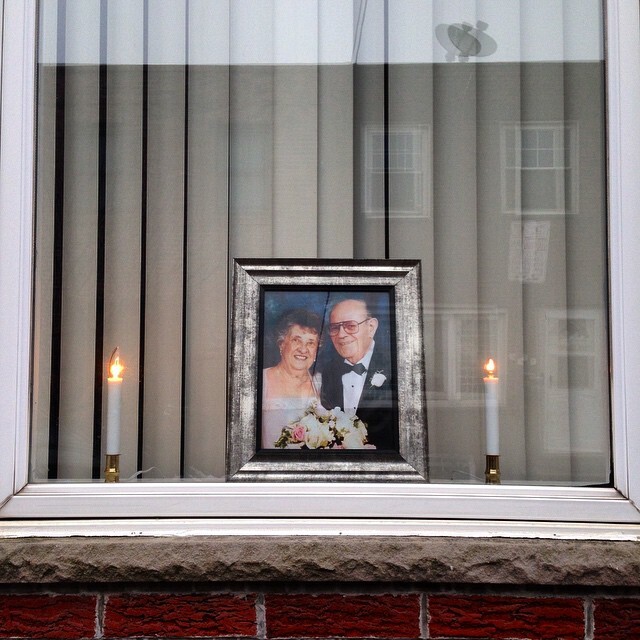 One neighbor–someone who represents an older South Philly, the South Philly that is descended from the Italian immigrants who first bought these houses in the early 20th century– altogether stopped speaking to Zoe and Lynn because of their declaration. This neighbor then circulated a letter calling the display an eyesore followed by commentary peppered with a reference to Hillary Clinton. I don’t want to overinterpret this incident. 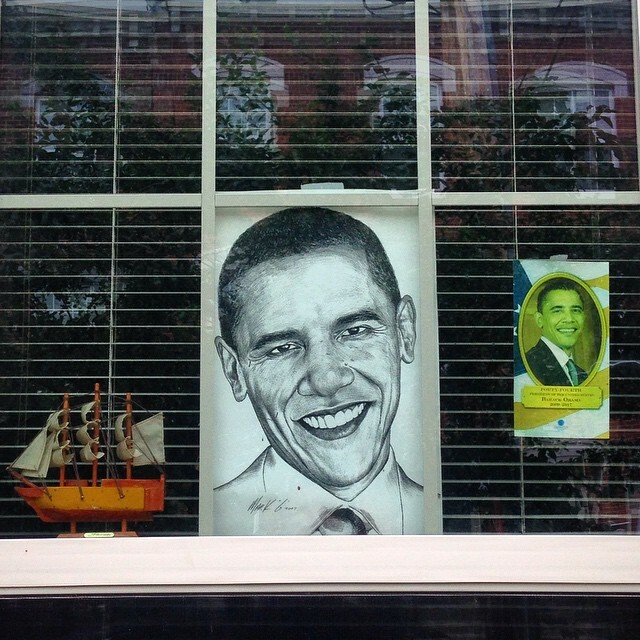 I don’t want to make window displays that deal in politics into something about the old South Philly versus the new one or about gentrification and the changing character of American cities from the turn of the last century to the turn of this one, though certainly you can trace that history through them. Rather, I think this is simply about how, in these anonymous cities, in these brick boxes that all kind of look the same, we make spaces in which we can express our private feelings about public issues and in which we can share our frustration and our joy with our neighbors, with our fellow Americans and our fellow Philadelphians. 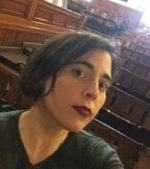 Mabel Rosenheck is a writer and historian who lives in South Philly and works at the Wagner Free Institute of Science. Her writing has appeared in The Toast, Vice Sports, the Mad Men, Mad World anthology, and elsewhere. She has a PhD from Northwestern University in media and cultural studies. Delightful! We needed something less contentious right about now! Thanks! One of my favorite things about Philly! 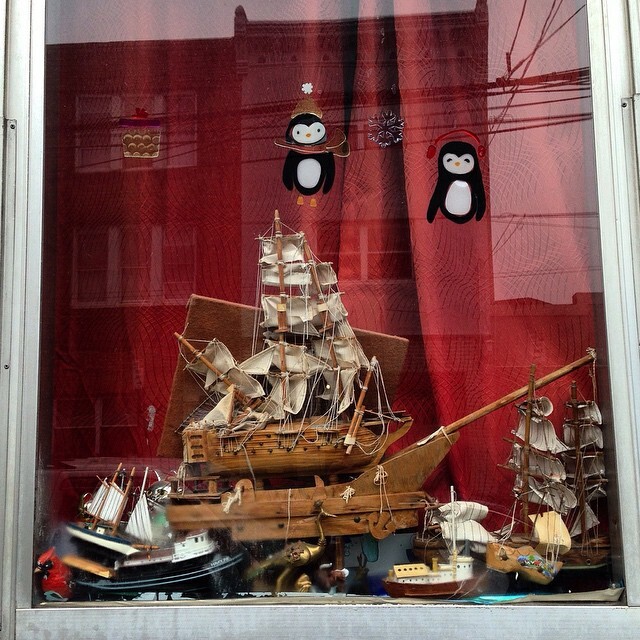 Fishtown has some great window displays that are heavily holiday oriented. I use to love walking through the neighborhood and taking pics of them, especially if they contained a sleepy cat or dog. Ha so “progressive” window displays are OK. Put up a pro-TRUMP sign and you’ll get a brick through your window. The tyranny of being politically correct in a lefty town. Reading comprehension is hard, isn’t it? I really wish someone began documenting the windows in the early 90’s when there many times more than today. I documented them in Queen’s Village/South Street area in 1969. Lots of photos of Kennedy. Great article … reminds me all over again why I love cities. Philadelphia has so much greatness. Image #10 is the best. Worthy of Eraserhood. Despite a right to do so, one does run the risk of retribution when posting political material. My father, now 94, still remembers his mother supporting John Kelly Sr. for mayor (in 1935), and having a brick thrown through their window that displayed a Kelly campaign poster. They lived on Waterloo near Dauphin at the time. Have we evolved into a more accepting citizenry? Recent events suggest not. 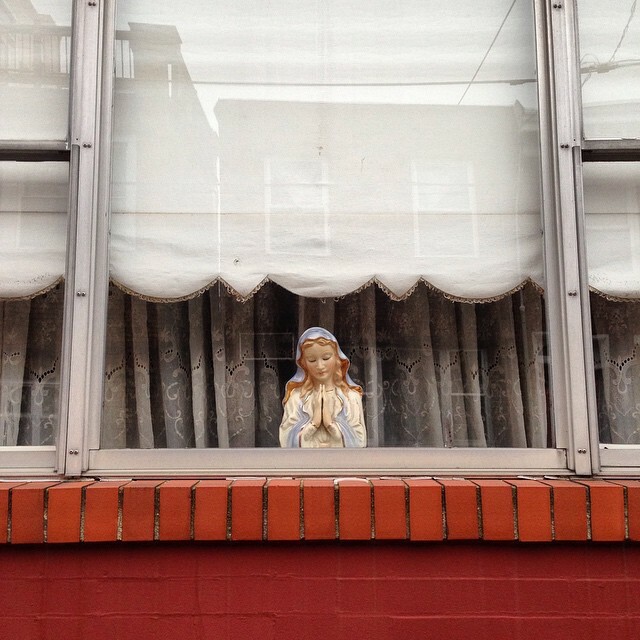 This article fascinates me because I just moved to Philly and have been using our large front window as a display space without realizing it was a local tradition. 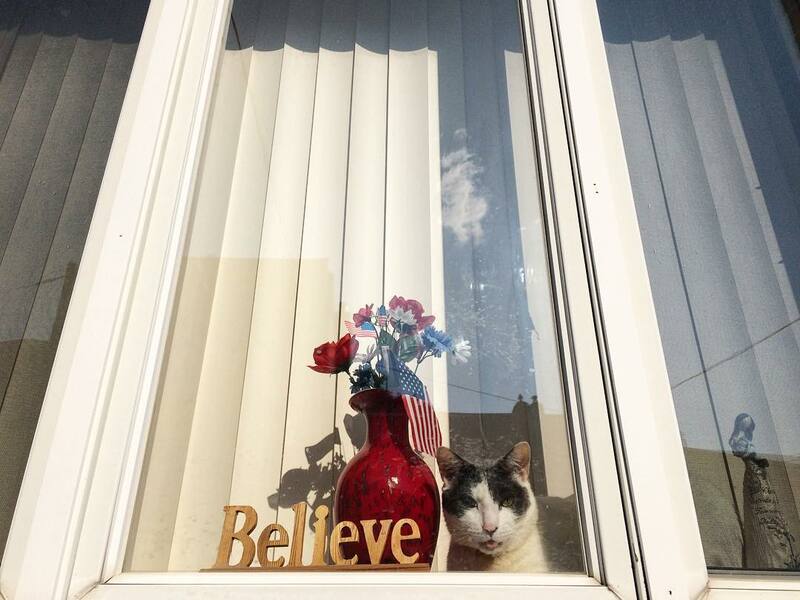 My neighbors have white cellular blinds firmly shut over their windows, but displaying modern art/globe light/a plant/my cat just seemed more neighborly. People certain seem to enjoy looking at it. Glad to hear I’m catching the Philly vibe!